Intake Manifold Small Block Chevy Ls1 Carbureted. 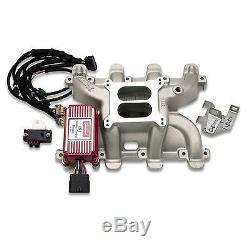 It also fits the Corvette LS6 engine and any other Gen III engine including the LM7 (5.3L), LR4 (4.8L), and LQ4 (6.0L). It allows the use of a carburetor on these originally computer-controlled engines, offering maximum power and a broad torque curve from 1500 to 6500rpm. The Performer RPM LS1 is available with an optional wiring harness and electronic Timing Control Module made by MSD? This ignition module is for LS1 (24x) ignitions only and works with OEsensors to fire the Coil-on-Plug ignition system and offers a choice of six timing curves. A special throttle and trans bracketthat works with 700R-4, 200R-4 and Turbo 350 transmissions is included, making the LS1 engine an easy retro-fit into any musclecar, street rod or marine application. INSTALLATION NOTE: Uses LS1/LS6 style individual port o-ring seals. Crankshaft sleeve #HP3795 and Flexplate #HP4004 is recommended when using a TH350, TH400 or 700R4 on a LS1; these items are available through Hughes Performance retailers or you can call Hughes at 800-274-RACE. Manifold height: A-4.50", B-5.40"; Carb pad height: 4.95. For the heights of all Edelbrock manifolds, Edelbrock Carburetor Recommendation CARB RECOMMENDATIONS: Edelbrock Thunder Series AVS or Performer Series (600-800 cfm) Carburetor. Last Updated: Saturday June 24, 2017 at 15:44:47. Most manufacturers prefer for the parts to go directly to them. All warranties are voided if the part is modified or damaged inany shape, form or fashion. Any products with missing, damaged or altered serial numbers. Any product that has been serviced without our express permission. In 1971, Warren Barnett opened an auto repair shop in Norcross, GA with the intention of supporting his family and to engage in his passion for drag racing. After a very short period of time, the company evolved into a racing parts business. From then on, Barnett Performance has been well known in the drag racing community as a serious contender on the track as well as the South's Racing Equipment Headquarters! Warren's sons, Glenn and Kirk Barnett are now running the day-to-day operations of the business, and time permitting, will continue their father's example by racing competitively at drag tracks all over the south. It's a far cry from the little shop in Norcross that started it all. Three scans ensures 100% accuracy of your order. Also, to make sure you receive your package unopened, the package is sealed with our own security tape. Customers who order by 5 p. We work hard to earn your business and keep it! The item "Edelbrock 7118 Intake Manifold Small Block Chevy Ls1 Carbureted" is in sale since Sunday, August 21, 2016. This item is in the category "eBay Motors\Parts & Accessories\Car & Truck Parts\Air Intake & Fuel Delivery\Intake Manifold". The seller is "barnettperformance" and is located in Decatur, Georgia. 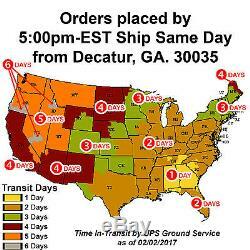 This item can be shipped to United States, Canada, United Kingdom, Denmark, Romania, Slovakia, Bulgaria, Czech republic, Finland, Hungary, Latvia, Lithuania, Malta, Estonia, Australia, Greece, Portugal, Cyprus, Slovenia, Japan, China, Sweden, South Korea, Indonesia, Taiwan, South africa, Thailand, Belgium, France, Hong Kong, Ireland, Netherlands, Poland, Spain, Italy, Germany, Austria, Russian federation, Israel, Mexico, New Zealand, Singapore, Switzerland, Norway, Saudi arabia, Ukraine, United arab emirates, Qatar, Kuwait, Bahrain, Croatia, Malaysia, Brazil, Colombia, Panama, Jamaica.